Remote sensing is defined as the science of analyzing and monitoring physical characteristics of an area with the measurement of its reflected or emitted radiation. Typically, remote sensing information is obtained from airplanes or satellites at a great distance from the surface of the earth, enabling regular monitoring of land, ocean, and atmospheric conditions for multiple applications, such as mineralogy, biology, defense, and environmental preservation. The data acquired for remote sensing can be represented in the form of images to make its analysis easier. However, such images present interesting characteristics such as a high spectral-spatial-temporal resolution, and multiple channels that provide valuable information independently or all together. These facts generate a big amount of information that must be properly and accurately analyzed. Some of the issues related to images from remote sensing applications can be treated as optimization problems. Thus, the necessity to design and implement optimization methods that possess a superior performance on the search for optimal solutions for remote sensing applications arises. This special issue concerns the implementation and development of optimization techniques able to find the best solutions for processing remote sensing images. 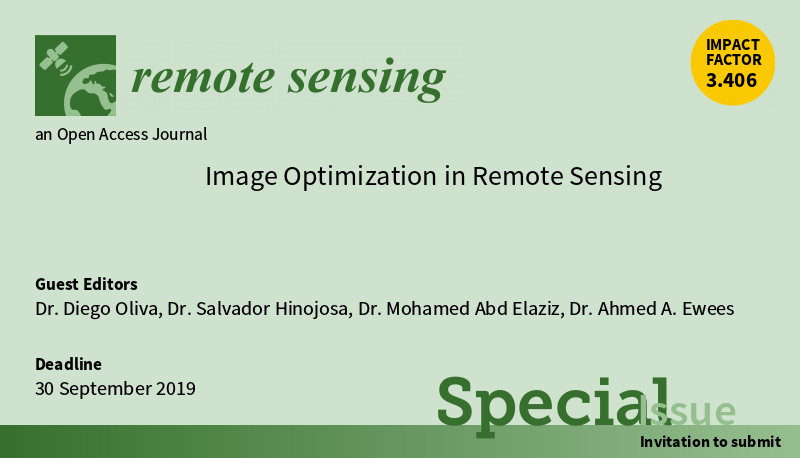 In general, in this special issue the latest advances and trends of optimization algorithms for remote sensing image processing will be presented, addressing original developments, new applications, and practical solutions to open questions. The aim is to increase the data and knowledge exchange between the optimization and remote sensing communities and allow experts from other areas to understand the inherent problematics of remote sensing. Moreover, authors are encouraged to present hybrid methods that might include the use of machine learning approaches.